My Tent Or Yours took Newbury's Betfair Hurdle with an ease rarely witnessed in a major handicap to give a fortifying boost to owner JP McManus, trainer Nicky Henderson and jockey Tony McCoy, after a week laced with sadness. The team had been dealt crushing news on Monday when their Champion Hurdle hope Darlan, by coincidence a faller when looking the winner of this race 12 months ago, died at the final flight of a trial at Doncaster. So impressive was the performance of the novice My Tent Or Yours, who carried the hopes of many as 5-1 favourite as he cruised five lengths clear of Cotton Mill, that speculation abounded that he could be supplemented for the Champion Hurdle itself. Introduced at 8-1 by Ladbrokes , it was not a decision taken by connections at the time. The six-year-old, purchased by McManus for this season on the suggestion of his retained jockey McCoy, only had three starts in minor novice hurdles to his name but could be picked out as the obvious winner from some way out as he crept along the inside rail. Henderson said: "It was a funny race. You expect a furious gallop in these competitive handicaps and I was amazed how they went. He could quicken up in that ground, but I've always thought the better the ground, the better he would be." The Seven Barrows handler was asked about the prospects of My Tent Or Yours heading for the Champion, and he said: "I hadn't thought about it. He's in the Supreme Novices' and that would be the obvious one. I know JP has Jezki in the race, but it all comes down to JP. "To lose one as we did - Darlan should have won this last year - but to find another one who looks as if he has the potential to go to the top is a big, big boost. It has been a difficult week and we've had to rally the troops and pick ourselves up. "We've been amazed by the support we've had. Nobody loves his horses more than JP, and AP was absolutely shattered. We all hoped Darlan was a Champion Hurdle horse. To find another that looks capable of going to the top table, there's a bit of justice in it." 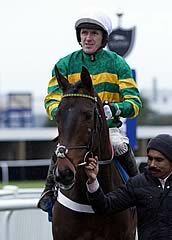 McCoy, who rode a winner at Warwick earlier, said: "To win a handicap off 149 is a good performance. He's a good horse, I thought that the first day I sat on him. I schooled him and I said to Nicky there's only one thing wrong with this horse - he's in the wrong colours. I recommended to the boss to get him."